World Pensions Council (WPC) development economists have argued that the twin considerations of long-term economic growth and infrastructure investment weren’t prioritized enough. Being prioritized as number 8 and number 9 respectively was considered a rather "mediocre ranking and defies common sense"[check quotation syntax] For the least developed countries, the economic target is to attain at least a 7 percent annual growth in gross domestic product (GDP). Achieving higher productivity will require diversification and upgraded technology along with innovation, entrepreneurship, and the growth of small- and medium-sized enterprises (SMEs). Some targets are for 2030; others are for 2020. The target for 2020 is to reduce youth unemployment and operationalize a global strategy for youth employment. Implementing the Global Jobs Pact of the International Labour Organization is also mentioned. ^ "Press release – UN General Assembly's Open Working Group proposes sustainable development goals" (PDF). Sustainabledevelopment.un.org. 19 July 2014. Retrieved 2016-10-18. ^ "17Goals – The SDG Tracker: Charts, graphs and data at your fingertips". Retrieved 2019-03-10. ^ Development, World Commission on Environment and. "Our Common Future, Chapter 2: Towards Sustainable Development - A/42/427 Annex, Chapter 2 - UN Documents: Gathering a body of global agreements". www.un-documents.net. Retrieved 2017-11-17. ^ Caballero, Paula (29 April 2016). "A Short History of the SDGs" (PDF). Deliver 2030. Archived from the original (PDF) on 2017-11-18. ^ "New Open Working Group to Propose Sustainable Development Goals for Action by General Assembly's Sixty-eighth Session | Meetings Coverage and Press Releases". Un.org. 2013-01-22. Retrieved 2016-10-18. ^ a b "United Nations Official Document". Un.org. Retrieved 2016-10-18. ^ "Commission on Global Poverty". World Bank. Retrieved 2019-03-10. ^ Thewissen, Stefan; Ncube, Mthuli; Roser, Max; Sterck, Olivier (2018-02-01). "Allocation of development assistance for health: is the predominance of national income justified?". Health Policy and Planning. 33 (suppl_1): i14–i23. doi:10.1093/heapol/czw173. ISSN 0268-1080. PMC 5886300. PMID 29415236. ^ "Extreme poverty is falling: How is poverty changing for higher poverty lines?". Our World in Data. Retrieved 2019-03-10. ^ Ortiz-Ospina, Esteban; Roser, Max (2013-05-25). "Global Extreme Poverty". Our World in Data. ^ "Education : Number of out-of-school children of primary school age". data.uis.unesco.org. Retrieved 2019-03-10. ^ "United Nations: Gender equality and women's empowerment". United Nations Sustainable Development. Retrieved 2018-02-04. ^ "Vision". Sustainable Sanitation Alliance. Archived from the original on 2015-04-19. Retrieved 16 November 2017. ^ "Contribution of sustainable sanitation to the Agenda 2030 for sustainable development - SuSanA Vision Document 2017". SuSanA, Eschborn, Germany. 2017. Archived from the original on 2017-11-16. ^ "Sustainable sanitation and the SDGs: interlinkages and opportunities". 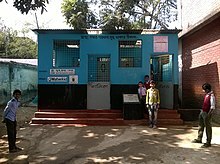 Sustainable Sanitation Alliance Knowledge Hub. 16 November 2017. Archived from the original on 2017-11-17. Retrieved 16 November 2017. ^ "What We Do". World Bank. Retrieved 2019-03-10. ^ "Progress of Goal 10 in 2017". Sustainable Development Goal Knowledge Platform. 16 Nov 2017. Retrieved 16 November 2017. ^ "Goal 12 .:. Sustainable Development Knowledge Platform". sustainabledevelopment.un.org. Retrieved 2018-10-15. ^ "GCEOA Chairman Underscores the Value of Big Data for the SDGS" (Press release). Global CEO Alliance (GCEOA). 2017-05-23. Retrieved 27 October 2018. ^ "IPCC — Intergovernmental Panel on Climate Change". Retrieved 2019-04-18. ^ "Global Warming of 1.5 ºC —". Retrieved 2019-04-18. ^ "Summary for Policymakers of IPCC Special Report on Global Warming of 1.5°C approved by governments — IPCC". Retrieved 2019-04-18. ^ "COP24: Key outcomes agreed at the UN climate talks in Katowice". Carbon Brief. 2018-12-16. Retrieved 2019-04-18. ^ "SDG16 Data Initiative 2017 Global Report". SDG16 Report. 16 November 2017. Archived from the original on 2017-07-23. Retrieved 16 November 2017. ^ "Leaving no one behind — SDG Indicators". unstats.un.org. Retrieved 2019-02-04. ^ "Gender equality and women's rights in the post-2015 agenda: A foundation for sustainable development" (PDF). Oecd.org. Retrieved 2016-10-18. ^ Hub, IISD's SDG Knowledge. 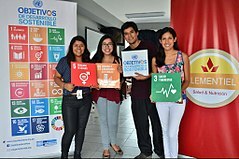 "SDG-Tracker.org Releases New Resources | News | SDG Knowledge Hub | IISD". Retrieved 2019-03-10. ^ "Eerste 'tracker' die progressie op SDG's per land volgt | Fondsnieuws". www.fondsnieuws.nl. Retrieved 2019-03-10. ^ "Sustainable Development Solutions Network | Ahead of G20 Summit: 'My Country First' Approach Threatens Achievement of Global Goals". Retrieved 2019-02-04. ^ "Sustainable Development – Baltic 2030". cbss.org. Retrieved 2017-11-11. ^ "SDG Tracker: Portals". www.sdg.gov.bd. Retrieved 2019-03-10. ^ "the-new-division". the-new-division. Retrieved 2017-11-11. ^ "How This Great Design Is Bringing World Change to the Masses". GOOD Magazine. 2015-09-24. Retrieved 2017-11-11. ^ "Global Festival of Action – Global Festival of Action". globalfestivalofideas.org. Retrieved 2017-11-11. ^ a b c "The 169 commandments". The Economist. ISSN 0013-0613. Retrieved 2016-02-19. ^ a b "Sustainable Development Goals 2016-2030: Easier Stated Than Achieved – JIID". 2016-08-21. Retrieved 2016-09-17.